Currently looking to purchase some Murano glass? You may be in Venice or planning to go there soon and you would like to know where to buy genuine glass art there. You will find there are many Murano glass shops, but not all of them are trustworthy: prices vary so much it is hard to tell what is the proper price, and counterfeit glass can be found even in Venice. Don’t risk guessing and buying in some random shop, we are here to help you avoid falling for the traps, so you can go home with some real, certified Murano glass. This Murano Glass Shop Venice Tourist Guide is here to help you avoiding the most common tourist traps. A. Venetian Glass, Murano Glass or Italian Glass? What is the difference? First, if you see art branded as “Italian Glass”, it is likely counterfeit made not in Murano, but in a different region of Italy. Murano is not a brand, it is an origin. Only artworks made in Murano can be labelled as Murano glass. Artworks labelled as “Italian Style”, or even “Murano Style”, are likely counterfeit. These vague labels could mean the glass was made in Czech Republic or even China. Then there is “Venetian glass” which can be confusing as Murano is a part of Venice. Some may call it “Venetian Glass” to describe the style, but be attentive to their aversion to label it as true “Murano glass”. “Murano Glass” is the most reliable label to search for. Unfortunately, the label alone can’t secure its authenticity. As a wise shopper, don’t be shy to ask questions about the piece. Be extra aware if you encounter an offer that seems “too good to be true”. It is a common trap used on tourists looking for a deal. You can check how to recognize real Murano glass in our follow-up article. 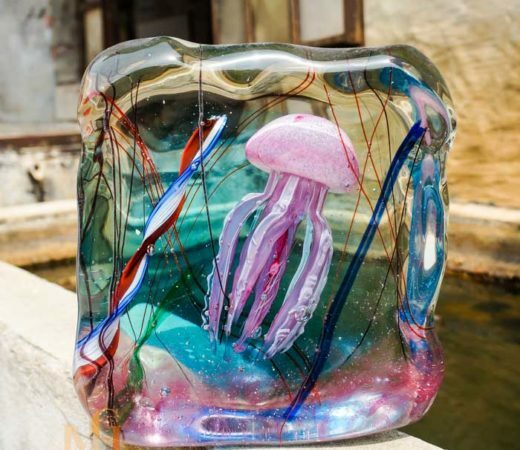 This helpful piece is how spot a common tourist trap in Venice centered around Murano glass. Salespersons, hired by glass factories, tempt tourists with a “free-tour” of Murano. It sounds harmless at first, but the “free-tour” will be brief, limited to one place, and end with pressure to purchase glass from their shop. The salespersons will only take tourists to the glass factory that hired them. There, they perform a short glassblowing demonstration. Then, they take the tourists to their over-priced shop. Tourists then feel obliged to purchase something to repay their free-tour despite it being short and limited. This is often where the highest priced glass is. They rely on the inexperience of the tourists to not know a fair price for glass. 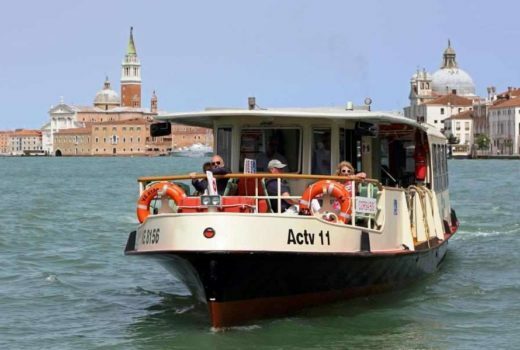 It is better go to Murano on your own by taking a Vaporetto, the water public transports of Venice, to Murano. You can check how to reach it in our corresponding article that lists which Vaporetto will take you there. In Murano, there are more Murano glass shops than cafés. It is Murano’s biggest attraction and many Murano glass shop Venice shops take advantage of the tourists. Even on Murano, there is counterfeit glass made in Czech Republic or China posing as Murano glass in the shop windows. Some artists have their workshops open to public where you can see the art being made before it is placed on the shelf. However, it is the real masters of glassblowing that operate behind closed doors to keep the secrets of trade sacred and in trusted hands. If you want to buy certified Murano glass from the best artists in Murano, visit our shop where you will find the best Masterpieces to fit to your home. Authenticity is guaranteed.